Renae’s story illustrates the power of allowing ourselves to be supported during pregnancy and labour. Renae shares her journey from a difficult first birth to a beautiful, powerful second birth. Renae had wanted and prepared for a natural first birth. She had a positive outlook, she had done the birth preparation and she was realistic, but not frightened. However her plans and expectations evaporated as she was overwhelmed by the pain of an intense induced labour. Renae opted for an epidural and experienced a damaging forceps delivery, under the threat of a caesarean. Before she even became pregnant with her second daughter, Renae decided that she needed and wanted more support next time. She decided that a doula would meet her needs. Renae’s doula was a source of supportive friendship, informative discussion and beautiful encouragement during Renae’s pregnancy. Renae’s second birth was empowering and drug-free with a natural third stage and ‘delayed’ cord clamping. It was everything Renae had hoped for. I went into my first birth with positive expectations. My sister-in-law had two natural and positive births so she was a great influence on me! My husband and I did a Calmbirth course which I loved (but he thought was a waste of time). I did a heap of magazine reading and read a few books. So I wasn’t scared, but realistic. I thought labour would be natural and instinctive. I was five days overdue and my doctor was concerned with my blood pressure. I went in for my 41 week appointment and was sent straight to the hospital from there. It caught me off guard! At about 7pm the next night my doctor put in the gel and the machine picked up that I was having ‘tightenings’ but they weren’t considered contractions. They weren’t too painful and I was able to sleep that night. The gel was repeated the next morning but it still wasn’t bringing on labour so I had my waters broken at about 1pm. When that didn’t start labour I went on the syntocinon drip at about 2.30pm. It took about an hour and then the ‘real’ contractions started. I breathed through them and by 6pm I was at 4cm. I was doing OK but would have done better if I could have moved off the bed, had a shower, or walked around but I was continually hooked to the bed! Then all of a sudden I had this huge long contraction that just didn’t stop! Oh my, it was so painful! I lost my focus. I had the gas and I’m not sure if it helped or hindered the situation. The drip had caused the long contraction so they turned it off to give me a little break. My doctor came back and checked me. I was 7cm (9pm). I was over the pain so I chose to have an epidural. The next two hours were pain free and I progressed to 10cm by 11pm. I pushed for about an hour and frankly gave up. I just wasn’t getting anywhere and I was exhausted. So my doctor called another doctor who did forceps deliveries and I got a huge top up of epidural. The new doctor said “If this doesn’t work you’ll have to get a c-section!” so I pushed as hard and long as possible (with him pulling!) and with that my baby Eloise was born. I had an episiotomy, and her head tore me down the middle, to the side, and her hand got me inside too. Thank goodness for epidurals! They put my baby on my chest and it took so long to stitch me up, she was pretty much screaming the whole time. I was shivering and not well at all. I didn’t feel the instant relief or a flood of love. I was so overwhelmed by what had happened. Soon after my first birth I felt positive. I believed that everything had happened how it had to happen and I was OK with that…for a while. But then I got talking, thinking and did more reading. Now I realised I wasn’t really happy with how things went at all. I didn’t feel I was strong enough to speak up or question the midwives or my doctor. I went along with what they said even if I was uncomfortable with it. The pain seemed to overtake my will to labour my way. At one stage, when they were putting the drip in my arm, I asked if I had to be hooked up to the drip the whole time. The midwife had said “Maybe, we will have to see how it goes.” Now I know that once you’re hooked up, it stays that way! Before my next birth, I decided to hire a doula. The idea mainly came from reading the Birth Journeys book. Hardly anyone around my area had even heard of one and I had to do a lot of explaining to my friends! I felt I needed someone with me who knew what I wanted and would speak up for me. My husband was there for me but he is not the type to question a professional. He was very supportive of my decision to have a doula. He felt that his job would be a lot easier on the day too. I think any pressure or worries he felt from our first birth were relieved knowing we would have a doula there. Sophie was a student doula and I knew her through a friend. We were pregnant at the same time (but only saw each other once during this time) so we had the basis of a friendship already. Then we bonded over our mutual feelings towards birth activism on Facebook and got talking about our births. Her birth was awesome and empowering. Mine was not! We had our first doula meeting at a play café with our daughters and we found we had an easy friendship. Sophie is so different to me in her parenting style but we agreed on some fundamental points and that got us talking. For a while I considered going in for a planned C-section. I thought it would be easier and at least I would get the baby with no damage to that ‘sensitive’ area that was so hurt last time. However talking to people and reading Birth Journeys (again!) helped me to want a positive natural birth. My mum is a very positive person and said from her experience (6 births) the first one is always the hardest! She helped a lot. I also had a miscarriage between Eloise and Charlotte and that seemed to change my perspective. Sophie was always only a conversation away with positive words and support. At one stage the baby was posterior and I was so worried about birthing a posterior baby as I had heard so many bad stories. Sophie sent me links to read to help baby get in a better position and every time we talked she would remind me to do the exercises – I was lazy at doing them! Sophie helped me to feel excited about birth. Just knowing that she would be there with me made me look forward to it! She gave me two books to read (one by Ina May Gaskin) and they were both a bit out of my comfort zone as Sophie is a lot more of an ‘earth mother’ than me! But I loved Juju Sundin’s Birth Skills. I read it when I was 36-38 weeks while on holiday and it got me in the mood to have a baby! I had lots of conversations about induced labours compared to natural labours. I also talked about being in control and having delayed cord clamping, a natural third stage and allowing my waters to break naturally. My friends couldn’t understand why I would want any of these or that they had that choice. I also talked to my doctor about my thoughts and my fears and she was wonderfully supportive. The midwives however, had never had a doula, rarely did delayed cord clamping and never did a natural third stage! I was told that delayed cord clamping is dangerous, a natural third stage can cause a haemorrhage and that my doctor wouldn’t do it! It shows they were misinformed! I just said “OK” and went ahead and wrote my birth plan with my doctor’s support. My doctor understood that I was well read and wanted the things I wanted for a reason! I never knew which midwife I would get so there was no point in challenging them. I was sure Charlotte would be late like her sister and I was determined not to be induced this time. I decided I was willing to go two weeks over. I decided to go to one last movie in Adelaide (100km from home!). I decided not to waste my time at home and go and enjoy myself. Whilst at the movie (10.30am, Life of Pi) I had a few niggles but wrote them off as braxton hicks – I was in denial from that first pain! I had lunch with a friend after the movie at 1pm and kept getting slight pains. At one time I had to sit down instead of going to get a drink as I couldn’t walk! But once again, I decided it was nothing. After lunch and a walk around the mall, I went to Bunnings to buy a hose (It was suddenly very important to buy a hose!!) but I left empty-handed as the pains were getting stronger and more frequent. I also had a headache so I bought some water and panadol and decided to drive the hour long trip home. On the way home, I called my husband and told him that I thought I might be in labour, but probably not, as it felt too easy. I called my doula Sophie and explained what was happening. She confirmed that it sounded like early labour and suggested I have a rest once I got home. During the drive the pains were bearable, coming every 15 minutes or so. When I got home, there was a lovely surprise from my husband (Matthew) – a beautiful clean house. He must have had the nesting urge instead of me! Instead of relaxing, I ran around the house packing my maternity bag. I was still in denial. With each contraction I would think ‘Yep, this is definitely real’ then when it was over I would think ‘Nah, it didn’t hurt much, so it must be braxton hicks’. I thought I should time them properly using an app on my phone and it turned out the contractions were 10 minutes apart and lasting about 40 seconds but they were still completely manageable. I decided to listen to Sophie’s advice and I went to bed. It was the best decision because I fell asleep in between the pains and I’m sure they slowed right down. I felt very refreshed after my sleep. The next few hours were spent having a nice long shower, texting Sophie (we were both very excited!) and watching TV. I held a heat pack to my lower bump and paced the kitchen during contractions. I focused on not clenching or holding on during contractions but letting go and relaxing. In between I rested on the fit ball with my eyes closed. It was quite enjoyable! At 8pm Sophie arrived. She was a lovely, calming presence (like I have often read about doulas) and she helped me to accept that this really was happening and I would meet my little girl soon! By this stage contractions were five minutes apart, still around 40 seconds long and not that painful. I continued to pace and added in counting my steps. I handled the pain quite well this way. Sophie had brought with her the best contraption, a stretchy belt to hold a heated wheat bag in place on my tummy and one on my back. It was a wonderful addition! Packed to the Rafters was on, and as it is my favourite show, I watched it in between the contractions with both Matt and Sophie sitting on the couch. It was a very calm and enjoyable time. During the ads we talked about our children, about Sophie’s labour, my previous labour and worked on convincing Matt that this was the real thing. I called the hospital at 8.30pm and told them what was happening. I told them I wanted to stay at home as long as possible and they were happy with that as their midwife started work at 11pm. I also called the on-call midwife who delivered my first daughter and she reminded me that the second stage with her was quite fast, which I didn’t know. I also had to factor in the 30 minute very bumpy drive to the hospital. By 11pm the contractions were closer and stronger, so I decided to leave for the hospital. I had so many contractions in the car and I dealt with the pain using strategies from Birth Skills by Juju Sundin. I pulled myself up on the roof handle, tapped my foot and counted the taps to distract myself from the pain – it worked so well. We arrived at the hospital at 11.30pm and I said to Matt that our daughter would be born the next day. I thought we still had hours to go. It still wasn’t as painful as I thought it was going to be. I was contracting frequently but they were short and once again pacing, breathing and counting helped. My midwife Marlene wanted to check the baby’s heartbeat but only managed two short readings as I needed to move around to manage the contractions. Marlene then checked my dilation, (which was horrible as I was lying down). She knew I didn’t want my waters to be broken so she just did a quick check and found that I was 8cms but my baby’s head was still high. As she removed her hand, something made me gag and I started to vomit. This somehow triggered my waters to break! Stuff was gushing out both ends, and my poor doula had to hold a bag for me to vomit. She was amazing and cleaned me up a bit before helping me to the shower. My husband had gone to get my birth plan and decided to also bring our bags in (as it was going to be ages until the birth) so he missed all the messy stuff! Once in the shower I felt overwhelming pain and I squatted and held onto the rail. It was a completely instinctive movement. I let out a loud moan. I had been quite silent until now. Matt later told me it sounded very animalistic. I experienced immense pressure through the constant contractions. I didn’t quite ‘get’ what was going on and I put my hand down and right on my baby’s head. I yelled ‘I can feel the head!’ Sophie was behind me the whole time holding the water on my back and telling me how well I was doing and that this was all natural. Marlene instructed someone to call the doctor and asked me if I could get onto the bed. I said ‘NO! !’ and got on to all fours. Marlene somehow got in behind me (a very small space!) and did her thing as I did mine with a lot of noise. I hardly remember pushing but instead seemed to ‘moan’ my baby out. It was incredibly intense and then BAM! There was my little girl! I was in shock and just stayed there for a minute, speechless! As I wanted to delay the cord cutting, Marlene had to follow behind me holding Charlotte, while we went to the bed and waited. When the cord stopped pulsating Matt didn’t want to cut the cord and neither did I, so Sophie did the honours. Charlotte was handed to a stunned Matt as I wanted to deliver the placenta naturally. It happened quite quickly and easily. I only had a slight tear which didn’t need to be stitched. From the waters breaking to Charlotte’s arrival it was only about seven minutes! We had only just made it to hospital in time. We don’t even know the exact arrival time as it happened so fast and everyone forgot to look at the clock! My second birth still makes me feel great! From moments after the birth I couldn’t stop smiling! I was in shock that it was so good. I feel like I’m amazing for doing it exactly how I wanted it – and it makes me feel proud. I feel that birth is so instinctive if you just let it be! As I’ve read – birth is not a medical problem – it’s a natural part of life. I bonded with Charlotte so much quicker and she is an easier and more settled baby than Eloise. I actually thought I hated the baby stage, but turns out I don’t! I had a positive birth experience because I believed I could have one. I was in control and made the necessary changes that I needed to make to make it happen. I looked at birth as something natural not medical and I did the reading to back it all up. What do you want other women to know about birth? That knowledge is power and if you don’t get the answer you want from your doctor or midwife – go to another one until you find one that supports you! To be strong – it’s your body, your choice!! What do you think your journey from your first birth to second birth shows or offers to teach other women? One bad birth doesn’t mean they will all be the same. You can make small changes to help you be in control and get that positive feeling. Talk to women and read about positive birth experiences because how you feel about birth starts in your head! Renae is 29 and she lives on a sheep and cropping farm in the near the Clare Valley in South Australia with her husband Matthew and daughters Eloise (2) and Charlotte (5months). Renae is a kindy teacher but she is focusing on being a stay-at-home mum until her kids are all at school. Renae loves to read and still gets to do a lot of it as her girls have been wonderful sleepers! Sophie is a doula who has studied with the Australian Doula College. Categories: Birth Stories, Inspiration | Tags: Australian Doula College, Birth Skills, birth story, birth support, calm birth, Delayed cord clamping, doula, epidural, Episiotomy, forceps, hospital birth, induction, inspiring stories, Juju Sundin, Positive birth, positive stories | Permalink. My wonderful VBAC starts with the terrifying caesarean I experienced bringing my precious three year old into the world. I now know that fear and stress can stop labour progressing. If someone had told me there was nothing to be afraid of, Maitreya’s birth could have been very different. My mum had six kids and she was told she couldn’t possibly birth naturally because of a rare condition where she has two wombs. My mother in law was full of stories about the horrors of birth and seemed to delight in telling me as many bad stories as possible. I had been led to believe birth was a terrible, dangerous thing. I didn’t know birth could be empowering, spiritual and an amazing natural process that my body was built for. I have one amazing book and an amazing doctor who helped me see this. I really wanted a natural birth. I went to birth classes and read a few books like Kaz Cook’s Up the Duff and The Complete Book of Pregnancy and Childbirth by Sheila Kitzinger. I thought I was prepared but all I knew was the mechanics of labour, not the emotional and spiritual side of birth. I was really vague with my first birth plan. I thought that they would know best and I should leave it up to them. When I went in to labour in the afternoon, I tried to stay at home like the midwives advised me, but the phone rang constantly. At first it was just a couple of casual calls and one of these was very welcome, as it was a friend telling me she was pregnant! I remember saying “Yay! I’m in labour, talk to you soon!” Then my partner’s family caught wind of what was happening and they seemed to call one after another to ask how long I had been in labour, when I was going to go hospital and lots of other questions. We also had a few unexpected visitors and my partner, Josh, decided they should be invited in for a drink. I was embarrassed to have contractions in front of the visitors so I kept leaving the room when I had them. I wanted my partner to be there for me but he was so distracted by the phone and the guests that he didn’t even have time to ask me how I was going. He seemed to treat it as just another day. I felt stressed and I wanted to go to the hospital to be away from all the intrusions. I asked Josh to call my mum and ask her to meet me at the hospital. He had to ask the last of the friends to leave so he could drive me in. It was about 7pm. I thought it would be quiet in the hospital but my birth room seemed so busy. People were coming and going. The lights were bright and it was noisy. I started to feel scared. Everyone seemed to be talking around me and not to me. I had tested positive for Group B Streptococcus so a cannula was put in straight away for antibiotics. It seemed like that was an excuse to give me everything they had. I agreed to it all in a haze. One of the midwives broke my waters with the crochet hook looking thing, then I had syntocinon a while after that. At dawn they gave me pethidine. I didn’t know what it was at the time. I remember being told “We are giving you this to help you get some rest” but it had the opposite effect. I started chatting away to a student nurse about a girl I knew at school who had the same name as her. I’m sure she thought I was crazy! I felt this excruciating stinging pain between contractions, but a midwife told me that I wasn’t having contractions so I wasn’t in pain! My mum told her, “She is in pain! Something’s not right!” The pain went on for a long time. I was exhausted and worried. After 20 hours of labour, I was being monitored constantly and I was told to stay on the bed. Finally, a midwife told me that I hadn’t progressed and I was actually going backwards due to the swelling of my cervix. I had only reached 5cm dilation and now I was back to 3cm. I was bleeding and my baby was distressed. They brought me the paper to sign for a caesarean. I was terrified of losing my baby and I agreed straight away. But I felt like I had failed. My little girl, Maitreya May, had a rough start so we couldn’t be together for a few hours. She had a huge cone head because she was stuck for such a long time. I had a long recovery afterwards. In quiet moments, I felt this huge regret. I believe that the trouble I had breastfeeding was because I didn’t see my girl for what seemed like forever after the birth. She had trouble latching on, but after almost two months of pain and perseverance we sorted it out and went on to breastfeed for two years. Maitreya always wants to be with me and as a bub she wouldn’t let anyone else hold her including her dad. I think her fear of separation comes from her traumatic birth. I felt like I had no voice when it came to people wanting to hold her, even when I knew she would scream. I didn’t have the confidence to say “I’d better take her back” when she was upset (which was pretty much every time someone else held her). The obstetrician who performed the caesarean was an older gentleman, and when he came to follow up and check my incision he said I should get my hips x-rayed if I wanted more children. He said my hips could be too small to birth naturally. That really worried me but I didn’t get an x-ray as I was breastfeeding Maitreya and then I was pregnant again! I was now terrified of birth and what might happen, so I spent the first half of my second pregnancy trying not to think about it much. I had heard of VBACs from books but everyone I knew just said why bother. They said I would probably have another caesarean anyway so why not just book myself in for one and then I wouldn’t even have to go in to labour. My doctor told me that a VBAC was possible but that the likelihood was slim and most women go on to have another caesarean. She was full of facts. She told me,“If you go overdue it’s a caesarean. If you labour for more than 12 hours – it’s a caesarean. If you don’t progress quickly – it’s a caesarean.” This didn’t help me prepare for a natural birth. And to top it off, one of my shared-care midwives told me a horror story about a lady’s scar splitting and bubs hand sticking out of the tear! I still wanted a natural birth despite all the pressure so I made sure I was fit and healthy. I did yoga because I wanted to be able to move, walk, pace around and have an active birth. I told quite a few people that I didn’t want to hear any negative birth stories. During my third trimester, the book Birth Journeys came into my life and I realised ‘I can decide what happens to me during birth. I can be excited and positive about my birth. It’s my birth. I will be informed and make choices and not just let myself be told what to do. I will listen to my body and my instincts.’ I learnt that I could speak up and ask for what I want starting at home and working my way up to telling the doctors. I told Josh that he could either be supportive of me or not be there at all this time! He was pretty sorry and would be very attentive this time. In my final month I decided I wanted a more supportive doctor. Dr Patty was another one of the doctors at my clinic. I had seen her once or twice in the waiting room and once she said “Ooooo… look at that lovely round belly” in such a motherly way that I immediately warmed to her. I had found out that she was an obstetrician about half way through my pregnancy, so now I picked up the courage and asked to see her instead of my normal doctor (Patty is now my regular doctor too). Dr Patty is such an amazing woman. She is originally from San Francisco and she goes back every year for Christmas. While she is there she spends a few weeks volunteering in a women’s clinic in Mexico. She told me how poor the clinic is. They have hardly any equipment so there is very little intervention there! She is more at home with natural births and has had to learn lots of ‘old midwife tricks’. I can tell she cares so much about the babies she births. One wall in her office is covered with pictures of babies she helped into the world and now my little Xaani is up there too. Patty asked me what I wanted to do and I said I would like to birth as naturally as possible. I told her about my first birth and my regrets. She said that I would be fine to have a VBAC, but there would be more monitoring this time round just to make sure I was progressing and that the baby was okay. She said I could move as much as I liked with the fetal monitor on, I just had to try not to get tangled! While Patty told me the statistics on uterine rupture, she also asked me if I wanted to have a big family. She told me that statistically the risk of uterine rupture would go up with each caesarean I had, but it would actually go down with each VBAC. I have always wanted a lot of kids because I love being from a big family, so this made me even more determined to go natural. I asked Patty if there was anyway to tell if my hips were too small and she said not to worry. In the 18th and 19th centuries poor nutrition, rickets and illnesses such as polio caused pelvic anomalies. As the obstetrician who performed the caesarean was from the older generation and older style of doctoring, he would think that a caesarean was because the mother was unable to birth rather than blame a failure in the medical system to provide a safe environment so labour could progress naturally. She kept saying that my body was fine and there was no reason that this birth would be like the last. She encouraged me and made me feel in charge of my birth – she made me feel confident. I had learnt that I’m a very private person and I don’t like to feel as though I have an audience. The one thing I really wanted was to have the minimum number of people in my birthing room. Dr Patty agreed that I could have just one midwife with me. I felt very supported by the hospital and midwives, especially by Hannah, the midwife who attended my birth. When I went in to labour I made sure my home felt safe; no phones, no visitors, just my mum, my partner and my little girl, Maitreya. My mum stayed with Maitreya and I chose when to go into the hospital. I felt happy, safe and in control this time. There was just one midwife and my partner present and the lights were down very low. I started doing my birth dance, walking round in circles and occasionally squatting with support from Josh. I thought it was going to take a long time as I didn’t feel overwhelmed by the contractions yet, so I had a shower. The contractions were nothing like I remembered. They swept in like a wave and then faded away. I didn’t feel like I was out of my depth and drowning like I did the first time. I remembered to breath into the pain, not vocalise it but use the energy to help my body do what it needed to. I came out of the shower and sat on the birth ball. I remembered a few mums from Birth Journeys talking about visualisation and how it helped them, so I visualised opening and my baby traveling down. It was working! I was progressing well and I knew this baby wouldn’t get stuck. I did have one surprise visit this time, but it was a welcome one! Patty said she had asked the hospital to let her know when I came in. This was her night off and I was in a public hospital so she was in no way obliged to be there. She said she hadn’t birthed a baby for a while and she didn’t feel right if she hadn’t ‘caught a baby’ for a long time. She made me feel special. She wanted to be there for me and my baby and her joy was lovely to see. Every birth was a special moment for her, not just another day at work. I wasn’t just another birthing mum, and my birth mattered. The final stage was tiring and my legs were shaking through most of it. Josh and Patty were both so encouraging, they were saying things like “You’re almost there”, “You’re doing great”. They really made me feel like superwoman! After only three hours of full labour, my beautiful baby girl arrived. Patty caught Xanni Lily and handed her to me for skin-to-skin contact. Xanni latched on, her eyes opened and she looked at me. Contented, elated, proud and in awe of my baby and myself – this is exactly the birth I had dreamed about! Kush is a 35 year old mother of two amazing girls, Maitreya and Xaani. Kush started making modern cloth nappies for her first bub and loved making these and other baby gear so much that she just couldn’t stop and had to start selling them! She now runs a business called Kushy Komfort (http://kushykomfort.com.au) selling her modern cloth nappies and other environmentally responsible products for mums and bubs. Kush lives in rural NSW with her partner of 18 years, a cat, dog, fish, chickens and a pet spotted python called Monty. Categories: Birth Stories, Inspiration | Tags: Birth Journeys book, birth story, Positive birth, VBAC | Permalink. Don’t underestimated the importance of how you feel – in birth and in the months or years after. Although the moment of birth occurs on one day (perhaps after many days of labouring) it is not just another day of no significance. It impacts a mother deeply, whether she is conscious of this or not. It influences the way she views her baby and herself as a mother. It influences the way she engages with health professionals and the support services provided for mothers and families. It influences how she feels about another baby and giving birth again. If you (or someone important to you) is unconvinced, approach your mother, aunty, grandmother, or friend who is one or two generations older than you and ask if they remember their births and would be willing to share their story. Ask them to tell you how it was when they gave birth. And be ready with a cup of tea, a hug and plenty of empathy – no judgement. We often do not realise, until it is too late, until after at least one birth, that birth matters and how we feel matters too. We often do not see until it is too late that if we want a positive birth, a welcoming birth for our baby, and a positive beginning to motherhood, then we need to become passionate about this and take ownership. As parents we need to take responsibility, make choices and advocate for our children – and this starts before birth. Sadly, the average or ‘normal’ birth experience in Australia is not a positive one. Of the hundreds of women who have told me their stories, many women have a disappointing or traumatic story to tell of their first birth in hospital. Mothers do not always feel safe, comforted and nurtured during labour. They do not always feel respected, understood or in control. They do not always feel strong, confident or happy after birth. For many women, birth is a complicated, risky and frightening experience, and they feel inadequately supported. The experience of birth often comes as a shock. It may leave a woman feeling exposed and vulnerable, uninformed and unimportant. Women may feel they are failing if their labour does not progress according to expectations. Women may feel frightened and anxious as their labour and birth seem to spin out of control. Mixed with pride and joy at the birth of their baby, women may feel a little disappointed after their first birth. Some feel betrayed and violated. One in three mothers are traumatised, some experiencing postnatal depression and post traumatic stress. Too many women feel disempowered, bullied or let down when they come out the other end of their first birth (One would be too many but women’s stories sugest it is much more common than that). I don’t know how the dads feel watching their wife or partner go through this trauma but I’m pretty sure they feel hurt and powerless too. They may feel they failed because they couldn’t protect their love from this ordeal. Some women come away believing they have failed. And some women come through angry and wanting to fight. They know somewhere inside that something was wrong. And it wasn’t them, it wasn’t their baby. It was the way their birth was managed and most importantly the way they felt during birth. Most women move on as best they can because we have been taught ‘That’s just the way birth is’. But this is not true. 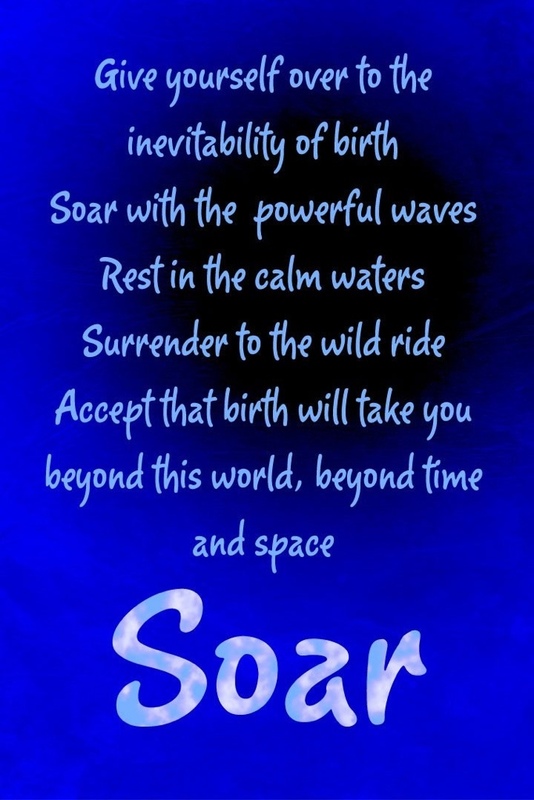 Birth can be a safe and natural, powerful and awe-inspiring, beautiful and incredibly positive experience. Of course there are no guarantees. The only things that can be controlled are the environment we place ourselves in, the people we allow to care for us, and the way we approach birth. No matter what happens in labour, there should always be time and space for the little things that will make birth positive – a respectful approach, a loving word or touch, recognition that every birth is sacred, special and a once in a lifetime experience. Every woman deserves to have a positive birth. Having a positive birth is not always easy, but it is worth striving for. 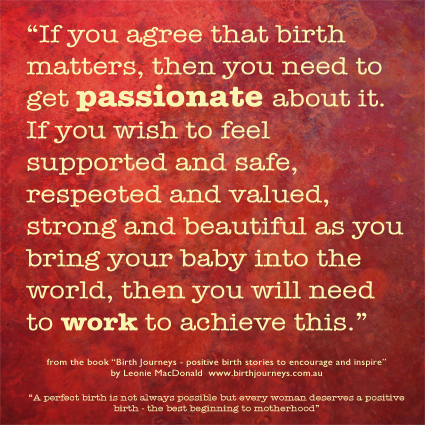 If you agree that your birth experience matters for you and your baby then you need to get passionate about it. If you wish to feel supported and safe, respected and valued, strong and beautiful as you labour and bring your baby into the world, then you will need to work to achieve this. It is not easy to stay positive about birth when you are surrounded by frightened people and frightening stories. It is not easy when you are told that you are insignificant and that birth does not work. It is challenging to hold on to your hopes and dreams when you are met with dismissal, resistance, or even derision. Find a community of supportive people who share your positive view of birth and mothering so that you do not feel isolated and alone. Find the carers and the place of birth that share your views on birth and will be able to support you and meet your needs. Make the choices and build the foundation you need for a positive birth. Be an active participant in your maternity care. Don’t just sit back and go with the flow without first checking where the current is going! Reflect on the beliefs you hold about what birth is like and your own ability to give birth. Consider where they have come from and how they serve you. Allow the beautiful images and words contained in the stories to seep into your mind, and use them to help you create and hold on to a positive view of labour and birth. The Birth Journeys book is a collection of positive and uplifting stories sharing the many different paths taken to a positive birth. I selected these stories with input from over 60 mothers, midwives, doulas and educators to offer positive, inspiring and believable stories that will help you feel positive, confidence and excited about birth! Listen to your inner self and also to your trusted carers. Be open to new ideas and different perspectives on what makes a positive birth. Be strong but don’t be wilful. 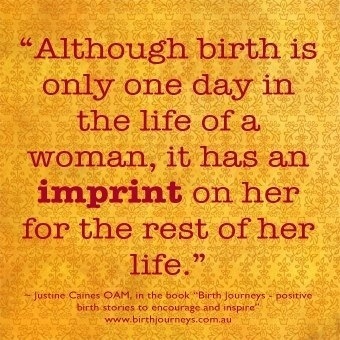 Know that birth does work and that a positive birth, even an amazing birth, is a possibility for you. Effectiveness of a Counseling Intervention After A Traumatic Childbirth: A Randomized Controlled Trial, Birth, 2005 Mar;32(1):11–19, Gamble J, Creedy D, Moyle W, Webster J, McAllister M, and Dickson, P.
Categories: Inspiration, Opinion, Uncategorized | Permalink.